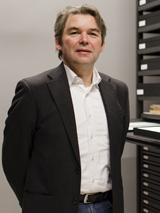 Dr. Peter van der Coelen, curator of prints and drawings in Museum Boijmans Van Beuningen is joining the editorial board of our periodical. The board was in need for this reinforcement in order to stimulate the flow of articles on prints, as most of the articles published so far were on drawings. With Peter van der Coelen, who holds a Ph.D. from Nijmegen University, the editorial board welcomes its first editor without a Leiden University background.